The book, which was written for social and physical science professionals and academics, provides a solid introduction to research methods using GIS. Redlands, California—Scientific data that's spatially analyzed produces highly useful information for academics, scientists, and other researchers, helping them answer questions and make well-informed decisions. The new book GIS Research Methods: Incorporating Spatial Perspectives, published by Esri, shows how spatial analysis using geographic information system (GIS) technology enhances research in the social and physical sciences. Authors Sheila Lakshmi Steinberg and Steven J. Steinberg explain, in a well-organized and easy-to- understand way, how to incorporate spatial thinking and GIS into research design and analysis. The book introduces readers to the value of thinking spatially, GIS basics, research design and ethics, data sampling and collection, volunteered geographic information, spatial analysis with Esri ArcGIS technology, and more. The authors are scientific researchers who have used GIS in their academic work. "A unique aspect of this book is that we focus specifically on how to integrate GIS into both qualitative and quantitative research," the Steinberg’s wrote in the book's foreword. 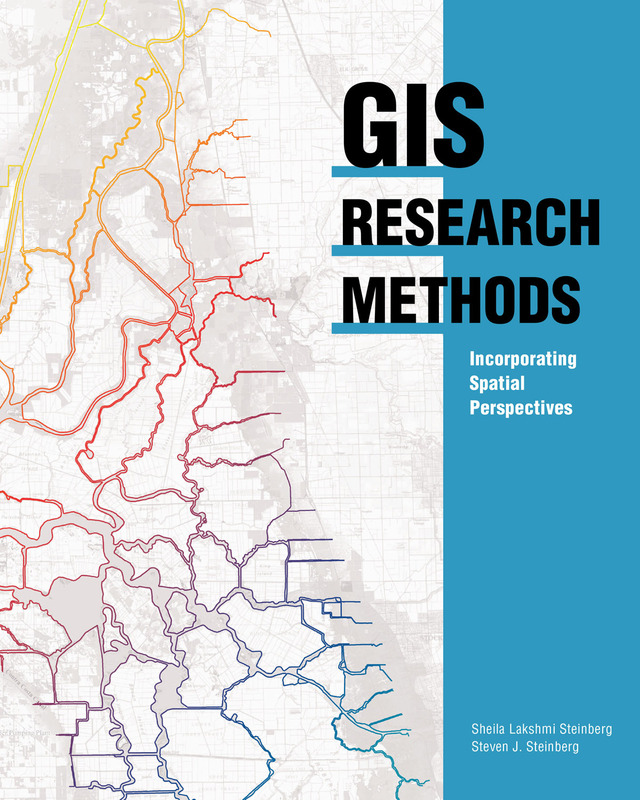 "Our objective in writing this book is to provide a foundation for GIS research methods and, more specifically, to integrate spatial thinking and spatial analysis into a research tool with clear methodological techniques." The book, which was written for social and physical science professionals and academics, provides a solid introduction to research methods using GIS. For example, readers will learn how to develop useful, spatial information-based interviews and surveys for collecting data in the field; select the right tools for spatial analysis; visualize spatial information; and communicate the results of analyses. The book also outlines what to consider—for example, geographic boundaries, the data, and a diverse group of stakeholders—when creating strong place-based policies. "Policy makers who consider space and place will be more likely to generate policy that is effective in the long run because it has a better opportunity to consider the concerns, needs, and perspectives that tie to data, people, and place," say the Steinberg’s. Sheila Lakshmi Steinberg is a professor of social sciences at Brandman University, based in Irvine, California. She earned her bachelor's degree from the University of California, Santa Barbara; her master of science degree from the University of California, Berkeley; and her doctorate from Pennsylvania State University. Her research interests include environmental sociology, culture, and GIS. Steven J. Steinberg is a principal scientist at the Southern California Coastal Water Research Project, a public environmental research agency based in Costa Mesa. He received his Bachelor of Science degree from Kent State University, his Master of Science degree from the University of Michigan, and his doctorate from the University of Minnesota. GIS Research Methods: Incorporating Spatial Perspectives is available in print (ISBN: 9781589483781, 440 pages, US$79.99) or as an e-book (ISBN: 9781589484047, 440 pages, US$79.99). The book is also available at online retailers worldwide, at esri.com/esripress, or by calling 1-800-447-9778. Outside the United States, visit esri.com/esripressorders for complete ordering options, or visit esri.com/distributors to contact your local Esri distributor. Interested retailers can contact Esri Press book distributor Ingram Publisher Services.